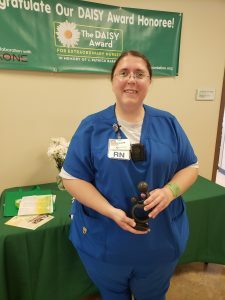 Four times a year, LeConte Medical Center honors an exceptional nurse who was nominated by a patient for providing care that went “above and beyond.” This fall, we are honoring Alicia Porter, an RN in our medical-surgical unit, with the DAISY award. The DAISY Award is an international nurse recognition program that celebrates the compassion and skills nurses bring to patients and families every day. As a winner, Alicia received a unique, hand-carved sculpture from Zimbabwe entitled “A Healer’s Touch,” a bouquet of daisies, and a DAISY award pin.